Why is the llama the best animal in the world? Well, there are many reasons but let me just narrow it down to a few. For one thing, they have a long neck without being as pretentious as a giraffe. They also like to spit, and who doesn’t like an animal that spits? If you’ve got an animal that spits you know you have an animal that likes what it likes and dislikes what it dislikes. The fluffiness of a llama is like no other animal. If you were small enough and the llama was big enough to ride it, you would feel like you were riding on a cloud. 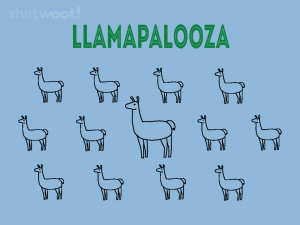 So if you could attend a llamapalooza, it would be one of the greatest things in the world. Wrap this cloth around your torso to pretend that you have. How Many Lives Do You Have?